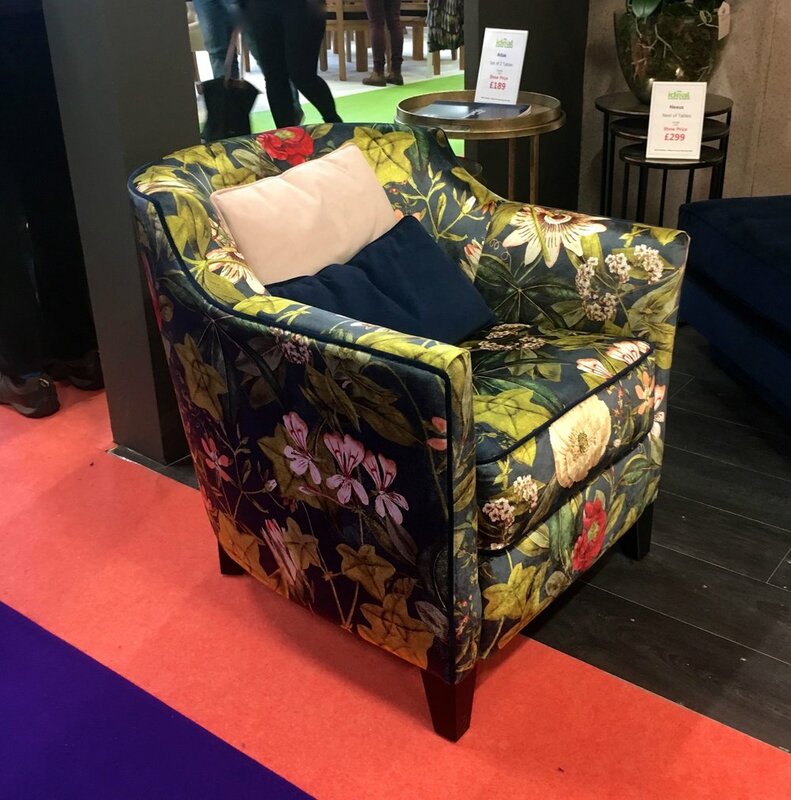 Today I’m sharing my highlights from this year’s Ideal Home Show, along with the trends that I noticed from the show. You’ll have seen in yesterday’s post that for me the good news was that the garden room sets were back, and that the garden section of the show was in the main section of the hall rather than in the smaller hall on the left as you enter. Of the four garden room sets I was really keen on two. I’ve already mentioned The Upcycled Garden so there’s a fair chance that that’s one of them, and you’d be right. You’ll not be surprised to learn that the other is The Grow Your Own Garden and I’ll be sharing more of those, and the other two garden room sets in the next few weeks. The thing that really stood out was colour. It was everywhere. And as an advocate of colour you’ll know how much that pleases me. It was bold colour too as the photos below show. Those chairs, you’ll notice that they have the same pattern. I only noticed that as I put this post together, I’m sure though the backgrounds were different colours. The ceiling and lamp shade above were in the child’s room in the Evolving House, I think that’s definitely the loudest ceiling I’ve ever seen and not sure it will be conducive to sleep. But it wasn’t all bright colours, the other colour that stood out around the show was pastel pink, it’s still set to be big in interiors this year. It featured in the room sets, with a pink kitchen and in the vintage bathroom room set; in the Evolving Home house and a gorgeous sofa in the interiors section of the show. And along with the colour came patterns, and plenty of them. While I’m not necessarily a fan of the frayed egg-shaped light the wallpaper behind it was bold and fantastic. In the room sets it was hard to find a room that wasn’t covered in pattern - the bedroom and living room - were full of it and clashing patterns too. And it wasn’t just the walls, the floors were patterned too, though not always at the same time. Last year I said that I’d seen plenty of pom poms, and sure enough pom poms make it big on the interiors scene. This year I noticed that there was plenty of ‘wire’ furniture - I’m not quite sure what else to call it. The lampshade in the boot room below is much more decorative than functional. I think we’ll be seeing much more of these. So that’s a quick round-up of what I noticed, and plenty of photos to give you a glimpse of the show. Are you going this year, or have you been?